October 6, 2017 by Antonio Diaz 1 Comment The editorial content on this page is not provided by any of the companies mentioned, and has not been reviewed, approved or otherwise endorsed by any of these entities. Opinions expressed here are the author’s alone. See our disclosures for more info. 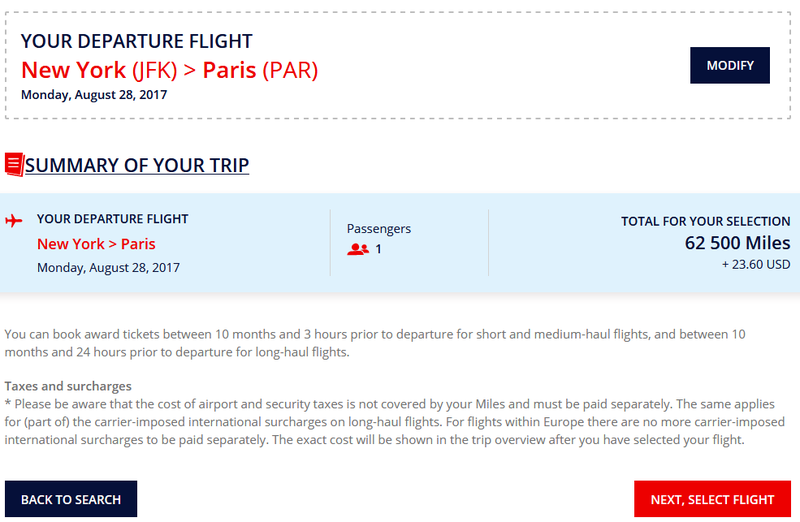 From the Air France homepage, select “Use Your Miles”. If you haven’t signed in yet, you’ll be prompted to do so. You’ll need to have an account set up with them in order to search for flights. Once you’ve signed in click on “Multi-destination Trip”. We’ll only search one way, but by clicking this you’ll go to the advanced options screen which is what we want. Here you’ll see what days award space is available. Notice that many of the available flights show fees of $200+. In this scenario, those are Air France or KLM flights. While they have a nice business class, those fees could be pretty pricey if there are several travelers or if you’re flying round-trip with them. Towards the bottom of the calendar you’ll notice a couple of dates that have fees of only $20+. Those are Delta flights in this scenario. If your flights are on the right plane, you’ll have lie-flat seats in business class and could arrive well rested to your destination. For this example we’ll select 8-28-17. The flight selected has a connection but is only $23.60 in fees. Both segments are in business class and the long segment to Paris has lie-flat seats. 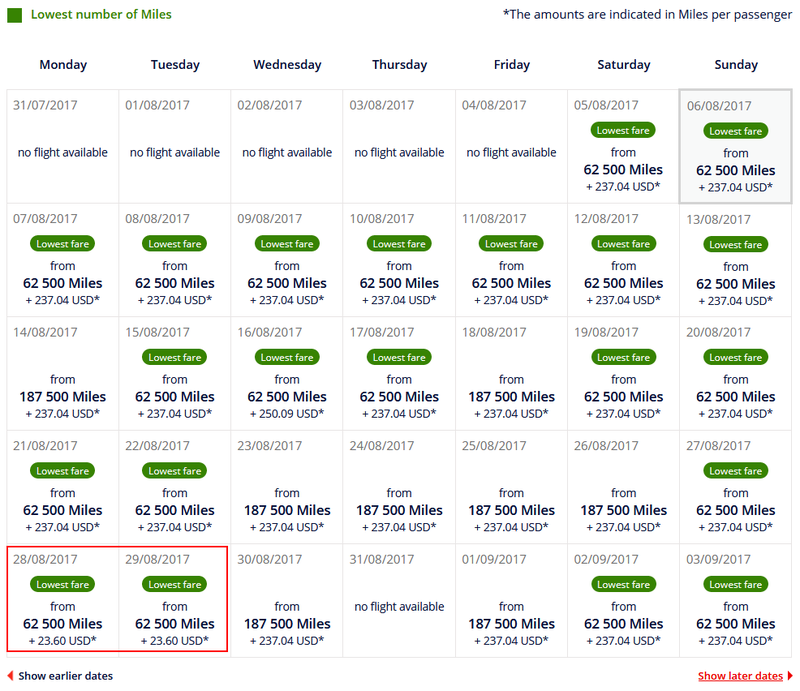 The price in miles for one person, one way in business class is 62,500 miles at the saver level. 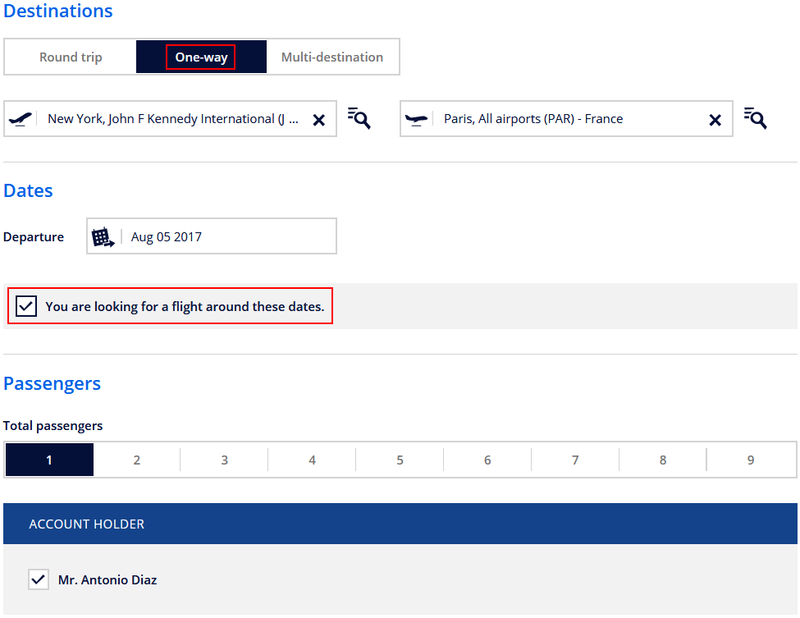 While there are other options that require less miles to Europe, this is a good option to know in case Delta flights fit your needs better than other airlines. 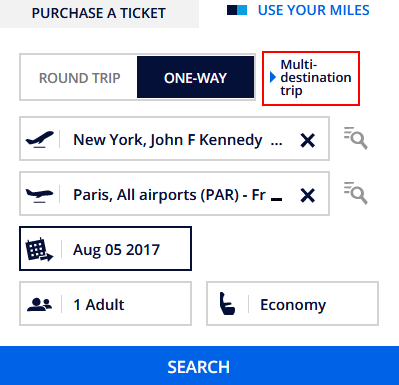 Booking this same Delta flight with SkyMiles could cost around 100,000 miles! No thanks! 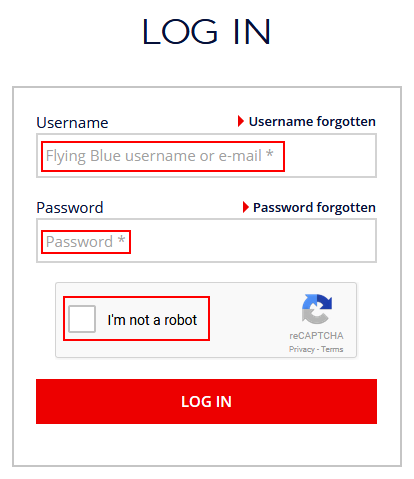 While the example shown above doesn’t seem very exciting, it’s good to know how to book flights with Flying Blue especially because of their Flying Blue Promo Awards. With these promos you can fly at discounted mileage rates to several destinations worldwide for very little miles. Another great thing about the Flying Blue program is how they define their regions. For example, Tel Aviv is considered part of Europe in this program and Puerto Rico is considered part of North America. What does this mean for us? 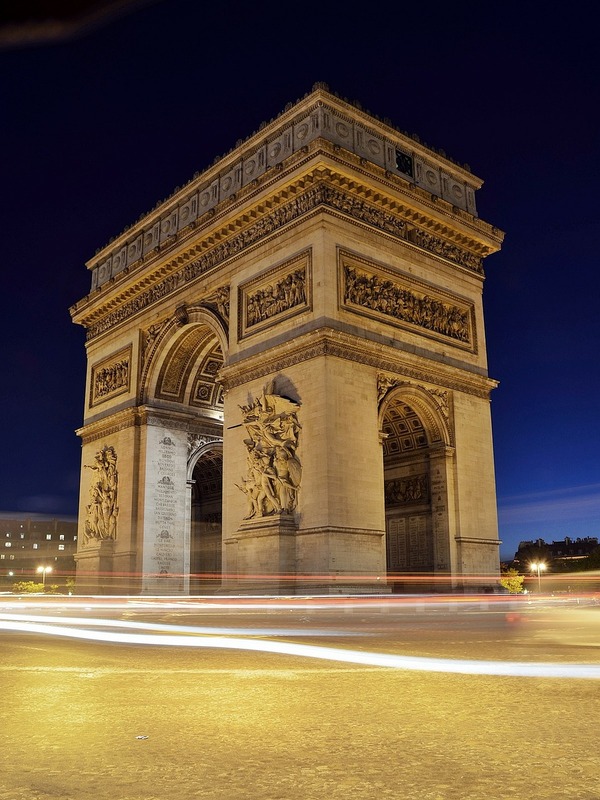 Flying Blue’s bad geography means mileage savings for us! 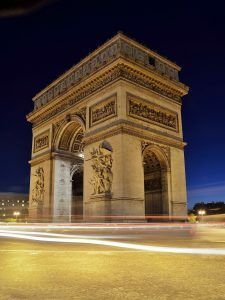 With some of these destinations being in different regions compared to other loyalty programs, you’ll save a lot of miles. When the Flying Blue Promo Awards list comes out, you’ll see the cities that offer reduced mileage flights. If the cities listed fit your travel plans, search for those routes throughout the dates of the promo. You’ll save a bunch of miles which could sway you to book through the Flying Blue program vs others. 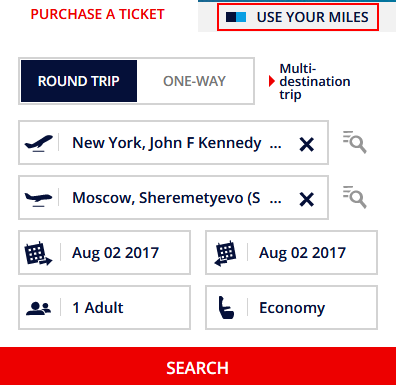 Knowing all the ways to use your miles makes it much more convenient for you since it gives you options. The Flying Blue program is often overlooked, but with their loosely defined regions it has some great uses that could save you some miles. Booking awards online through them is pretty easy too so that’s a plus. Where will Flying Blue take you? I live in Vancouver Canada and mostly travel on Alaska to Hawaii. or other US cities. I like my Alaska credit card and the benefits it gives me. I have some Flying blue points from a trip last year to Amsterdam and Spain. 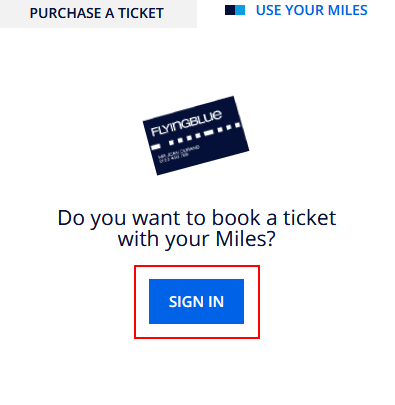 Can I transfer the Flying blue miles to my Alaska miles account? Or can I use the Flying Blue miles for a flight within the US or from Vancouver to the US?